vScheduler 24x7 Build 2018.09.30 Released. I/P | LIST, Remove I/P, Overlay (1-4) Tgl/In, Set IMV, IMV On, IMV Off, IMV Tgl, Set Image, Set Text, Text Colour, Count Down. After restarting vMix/vScheduler 24x7, there is no option to retrieve current running event from List or PlayList in vScheduler 24x7. vScheduler 24x7 - vManager.png (68kb) downloaded 9 time(s). 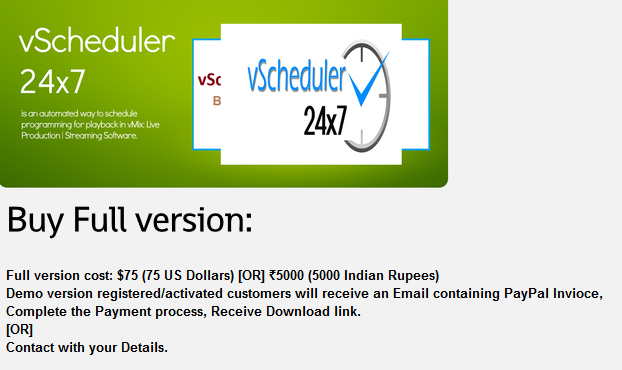 vScheduler 24x7 - vController.png (55kb) downloaded 7 time(s). 8 users thanked vijay6672 for this useful post. Is there any support for NDI, or it uses vMix API functions? Based on vMix API functions. 1 user thanked vijay6672 for this useful post. When will you make Download available for testing? Currently under beta testing and expected release date is 30th may. 2 users thanked vijay6672 for this useful post. The required functions are declared. Any update on release date? Any idea when this is happening? When Will We Have The Download Link? It would be an excellent feature to have vScheduler "Loop" the playlist with a toggle button. Otherwise, look forward to the excellent update in the coming days. Will think over the possibilities. vScheduler 24x7 Build 2018.06.14 Released. FREE Demo version (Limited Features - Unlimited Time) available. - will it work on a different host than the vMix one ? Meaning can we set the vMix host IP address to be used or it is only designed for 127.0.0.1 ? Different host... will be implemented in next version. Yes, It supports UNC Path. Any One did try it Up ? Vijay, 75 USD for the licence it's a little be expensive, did you think ? Your demo, how many time it last ? It's a fully working demo or some set will not work ? 1 user thanked Charssay for this useful post. Will think again about that. Limited Features for Unlimited Time.